So, this is my first post... and I'm going to start with telling you about my new life as a wife and proud mother of a black cat! Two and a half years ago I became a committed girlfriend. 14 months later I became a diamond wearing fiance`. And just 3 months ago I became the privileged wife of Matthew Fong and my name has never been easier to write! Matty and I married on 21st November '09 and it was the most WONDERFUL day of my life! 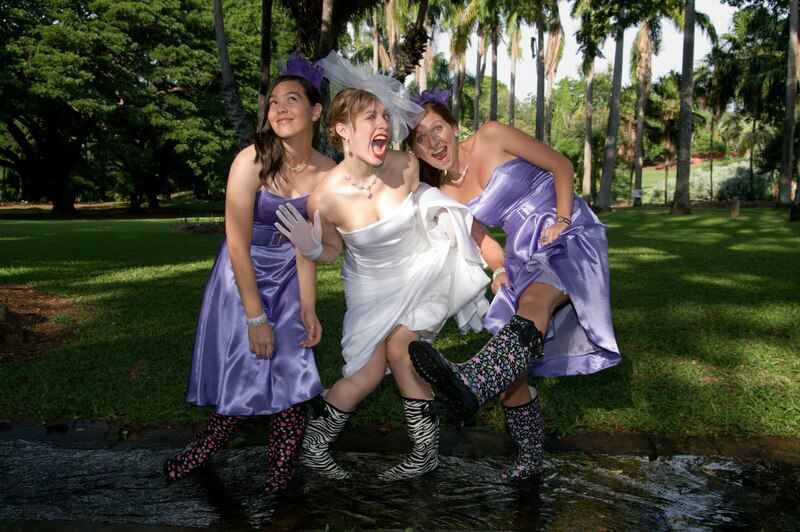 Although being a wet season wedding, we were blessed to not get washed away by any monsoonal rains. However the weather was still very humid and hot which did have an affect on my make-up! Matty, his Best man Stuart (his brother) and groomsman Luke were like peanuts roasting in an oven of a 3 piece suit, what were they thinking? On the other hand I was very pleased to have my maid of honor Cat and bridesmaid Kathleen (Matty's sister)wear cute strapless, knee length dresses. I'm proud to say that I made the girls dresses as well as my own white strapless gown. My dear mother was a great help in finishing off the hand stitching that by the last few days, I did not want to do! Cat is my best friend and she was an amazing maid of honor (MOH). Most MOH's are that particular friend that you allocate a ton of jobs to however, I was a very... hmmm whats the word? I was an independent bride-to-be and I preferred to do everything myself. I made the invites, the dresses, the table centers and the name cards. I picked the flowers, chose the colours... and drove my MOH crazy with no delegated jobs! I did little delegating but unknown to cat she was my emotional strength throughout the entire lead up to the event. I didn't need a maid of honor to run my errands, I needed my maid of honor to be my friend... and that is exactly what Cat is. Oh, and by the way... Cat organised the most AWESOME hens party ever!!! And despite the turn out, wearing hot pink zebra stockings and a tutu could not have been as epic if it weren't spent with Kathleen, Anna and Cat! RIP Jessica's Hens Party! Now your all prob wondering about the giant UFO on my head in the pictures... don't ask cos I LOVE my bridal UFO! I have so much to write about when it comes to my wedding but for now I'm going to sign off here... Night all. The Truth about New Years Resolutions!